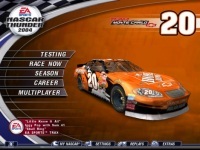 NASCAR Thunder 2004 is a car racing simulation game on fast tracks published by Electronic Arts in 2003. There are six game modes available on full version including career mode, season mode, online race, tutorial, lighning challenge, and speedzone mode. The demo version allows users to race on two tracks: Texas Motorspeedway and Talladega Superspeedway track. Get ready when the green flag has dropped. Find the best line to boost the car as fast as possible. And don't crash with other cars or with the boundary wall. Accelerate, steer, and brake = Arrow keys. Look left, right, or behind = C , V, B.